Hero of the Empire by Candice Millard. Doubleday, 2016. Paperback/softcover. 416 pages. This is the third nonfiction book that Candice Millard has written, and with it she continues to prove just how adept and talented she is at writing about important historical figures in a thrilling and informative manner. I received an ARC of Hero of the Empire prior to reading any of Millard's other work, but I enjoyed Hero of the Empire so much that I immediately went and picked her up her two former works, The River of Doubt and Destiny of the Republic, and fell absolutely in love with her writing. Millard has a remarkable way of creating gripping nonfiction narratives about lesser known or studied events in the lives of these notable men - events that, in a way, seem to define who they are and highlight many of their most admirable qualities. 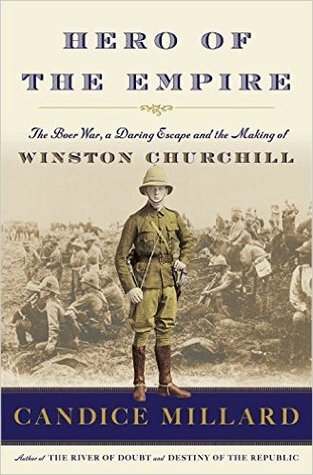 In Hero of the Empire, Millard focuses on the period of Winston Churchill's life in which he is captured as a prisoner of war and his subsequent escape. I'm sorry to say that I am - or was - woefully ignorant regarding much of Churchill's life and history, but he is one of the many figures that I have been wanting to read more about. Suffice to say, I had absolutely no idea that he was once captured as a prisoner of war. Millard writes in an incredibly fluid manner that makes it easy to follow along with the current political and social issues occurring at the time of the story. Rather than dumping the reader into a setting and time period in which they may or may not know its history, she takes time and great care to make sure that the background of any conflicts, struggles, and political happenings are clearly explained and allow the subsequent events to make sense. At times, it almost starts to feel as if Millard is going off on a tangent about a topic that is only slightly relevant, but right when you think it's gone too far, she brings everything right back around to Churchill and his journey and it all suddenly makes sense. Millard's description of Churchill is, in my opinion, perfectly well-rounded. She doesn't paint him in a black and white manner as being a solely a 'great man' or a 'bad man,' but instead provides and unbiased look at his qualities and personality traits - positive and negative. Churchill initially comes off as a rather arrogant man, and I had never liked that aspect of him. I felt how he treated people was often rather rude and inappropriate, but Hero of the Empire gave me a much more well-rounded look. It let me see both the negative and positive sides of his qualities; for instance, he may have been a bit arrogant and acted in a superior manner, but he was also steadfastly loyal and a born leader. He knew how to take charge and create well-formed plans that would allow him to succeed, all of which are admirable qualities that create a good leader. One of my favorite aspects of Millard's writing that works extraordinarily well in Hero of the Empire is her insights into the cultural and political events of the time. She doesn't just tell you a heroic and miraculous story about Churchill, she instead tells a story that also analyzes the motives, attitudes, and events of everyone involved in the period. She explains the why the British are involved in this issue, she describes the attitudes of the Boers and their history in South Africa, and she also brings great attention to the native African tribes living in the area, who are the original inhabitants of the area. I loved how deeply she went into the background of these various groups of peoples, and I particularly enjoyed her research on some of the African tribes, such as the Zulu and Xhosa. Millard covers all bases, which makes for a nonstop and wonderfully readable book. Overall, I am giving Hero of the Empire four-and-a-half stars for its riveting narrative and superb writing.